Hello everyone! 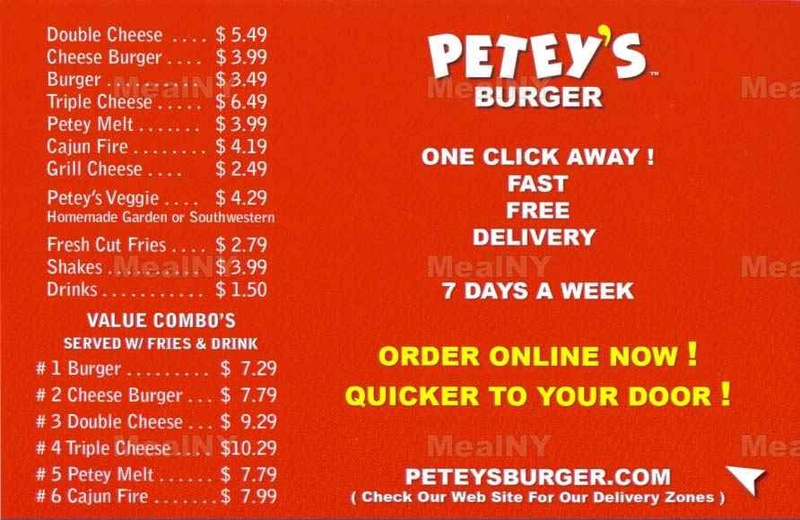 Today I’ll be giving you very personal review of a burger joint called “Petey’s Burgers” located in Long Island City (AKA Queens) New York. I will be reviewing on a few things. 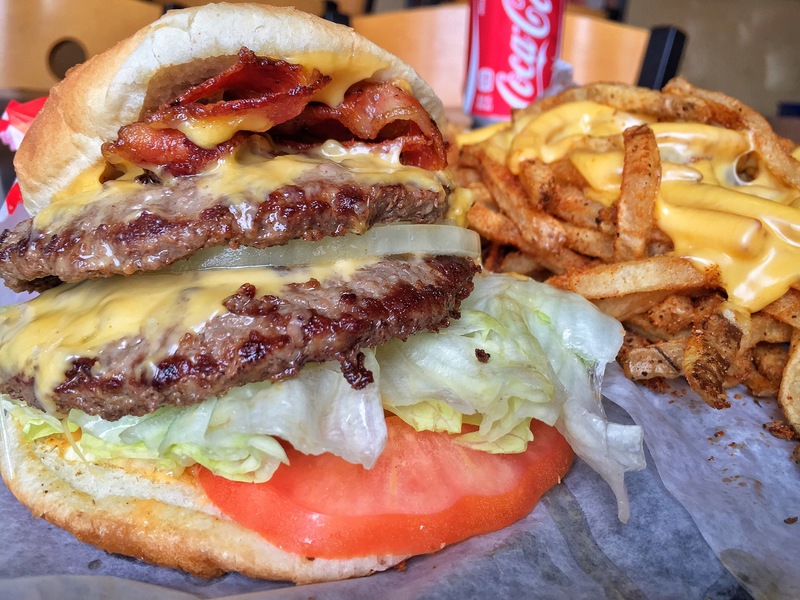 Food – i ordered the double bacon cheese burger with everything on it & of course, bacon. (Bacon & Cheese are extra .50) worth it period. I’ll start you off with the first bite. One thought comes to mind, Amazing! Perfectly cooked patty, soft bun, crispy lettuce, crunchy tomato, bacon (not to soft not to crunchy) just how I like it & as an added bonus they spread a nice layer of thousand island dressing on all their burgers. I got a side order of Cajun Cheese Fries, a little bit on the spicy side but tasteful. The cheese, could’ve been better. I’m guessing they through a slice of cheese and quickly melt it in the broiler or microwave. Reasons why I don’t like cheese fries is because the cheese gets cold and hard quick so it’s a race against time to have gooey cheesy fries. Overall I really enjoyed the burger, very juicy and all the ingredients perfectly compliment each other. I would say the price is average, but worth it for the quality of food in return. Menu – Not a big menu which I like for burger joints, its quick and straight to the point. I don’t feel like reading a novel when trying to order a burger. Service – I was greeted as soon as I walk through the door. I placed my order and about maybe 5-10 minutes later my food was ready. Very quick! I like that. Presentation – The Burger, although tasted amazing it was poorly put together. I was a bit surprised because the very first time I visited this place the burger was presented to me perfect! 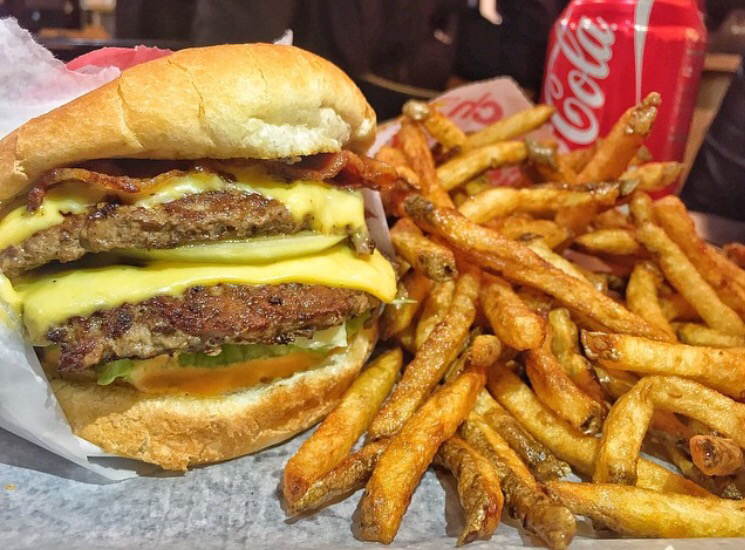 Take a look for yourself, that’s a well put together burger. Unfortunately, this time not so great. Overall Rating – I would have to say Petey’s Burger is a great spot to eat if your hungry and in the mood for a tasty burger n fries. Amosphere was cool not too crowed lots of places to sit. I would defiantly recommend this place as a spot you should try. I give Petey’s Burger 4/5 stars! Couple things that would’ve made it 5/5. Fountain soda. I’m a HUGE fan of fountain soda. There is just something about fontain soda that is so much better than canned. Service – You have to get up and get your food at the counter, if they would bring your food to you that would be great. The place isn’t that big to the point where they couldn’t. I don’t know about you but once I sit down I really don’t like getting back up for anything. Entertainment – They have a wall TV but it wasn’t on, maybe a little bit of music in the background or something so you will not be in total silence while eating or in someone else’s conversation. Thank you everyone! Please make sure to like & comment below letting me know what you think! Previous postCheesy Buffalo Chicken Dip!